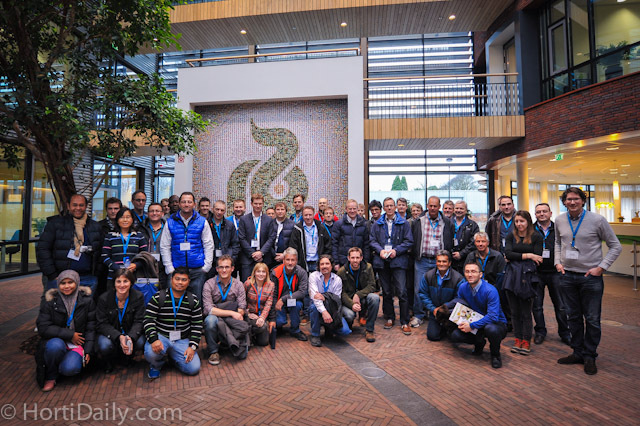 The group on the first day of the tour at the Headquarters of seed breeder Rijk Zwaan in De Lier. 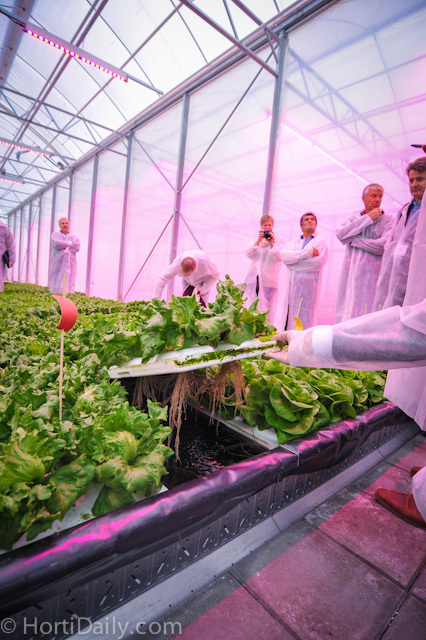 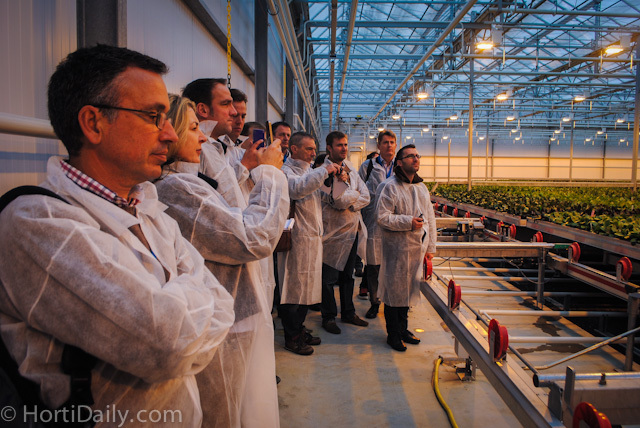 During the tour we visited several innovative greenhouse growers. 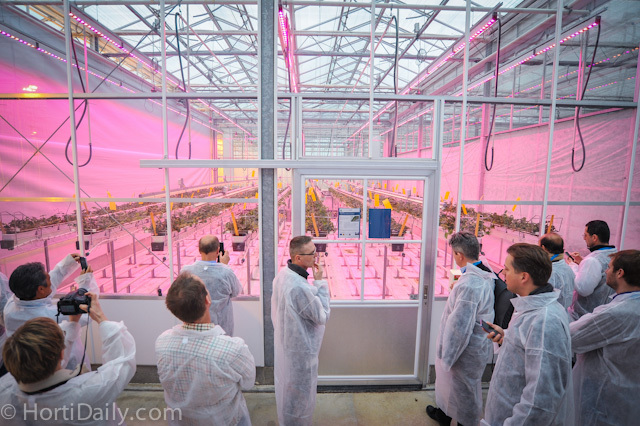 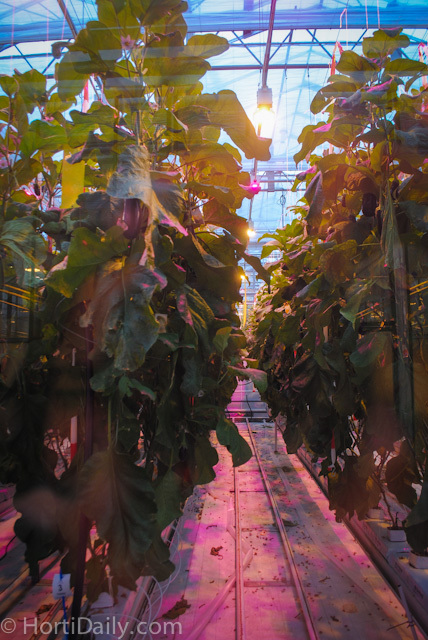 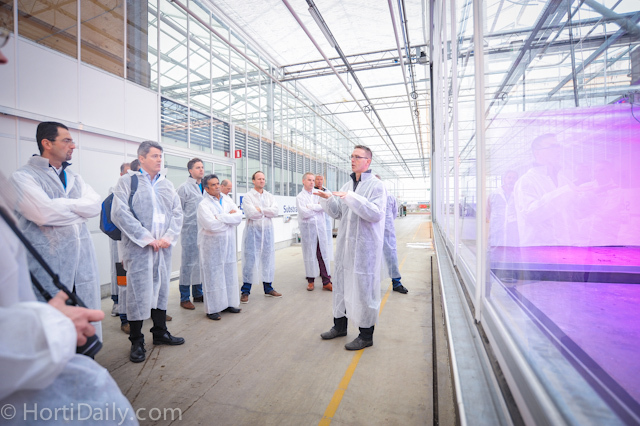 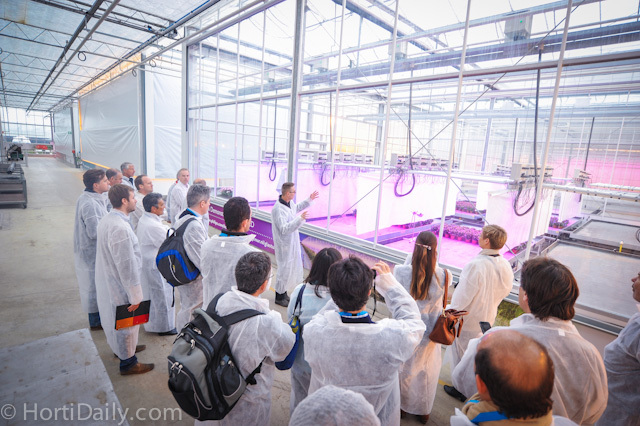 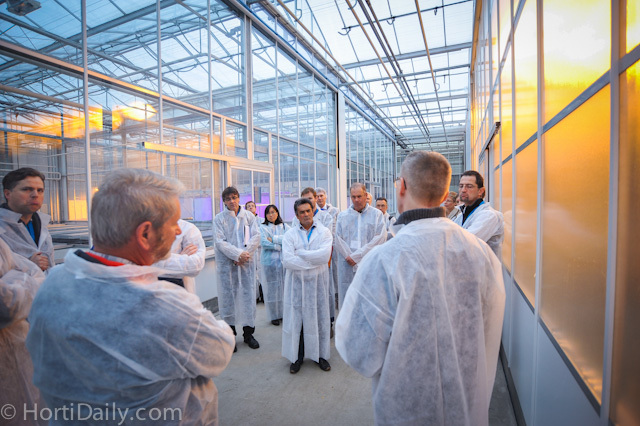 We had discussions on current developments and took a look in the future of practical horticulture during a visit at the Horti Science Parc in Bleiswijk. 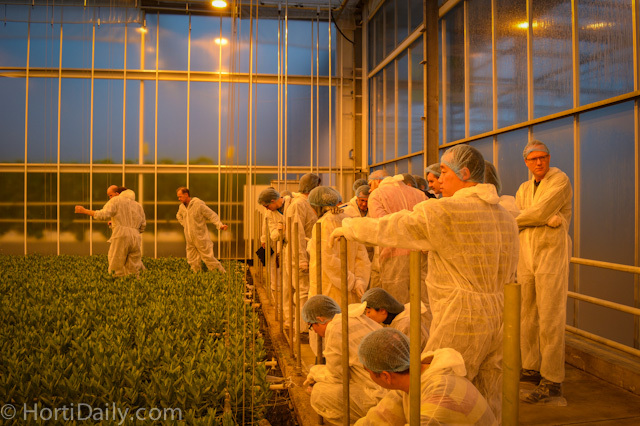 At the Demo Nursey Westland several project were on display. 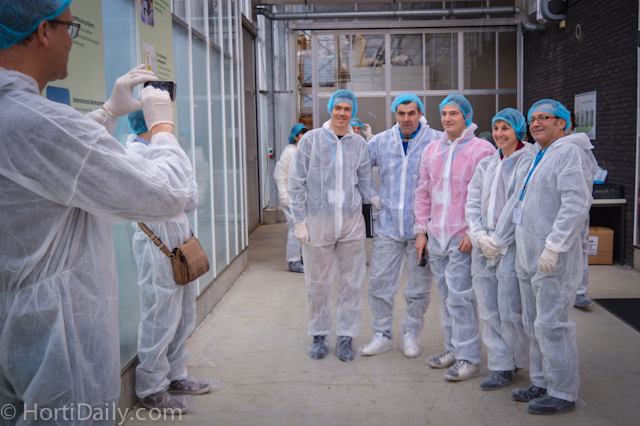 One of them was Futagrow. 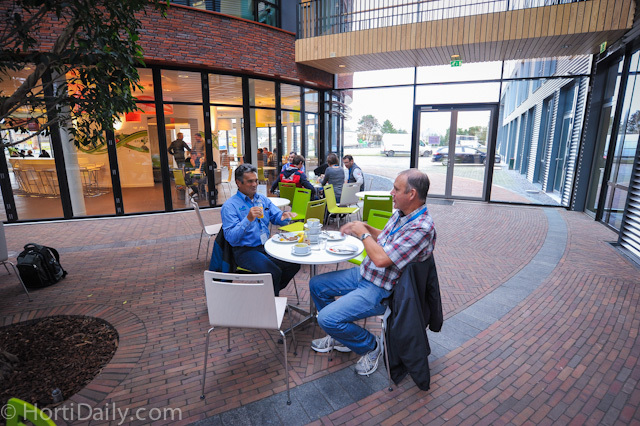 Discussion on the use of gutter systems. 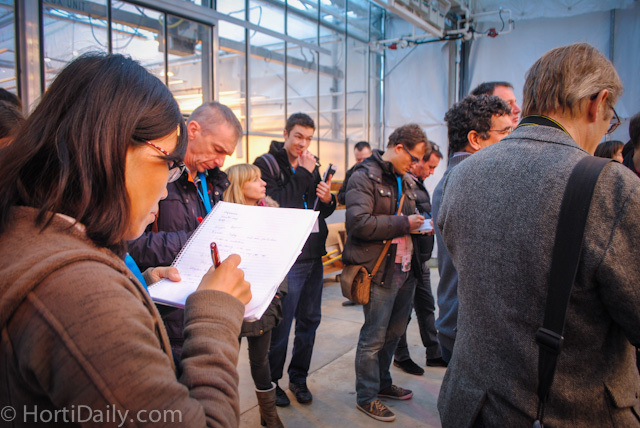 Li Liu of Costa Farms Australia writing down as much as she can. 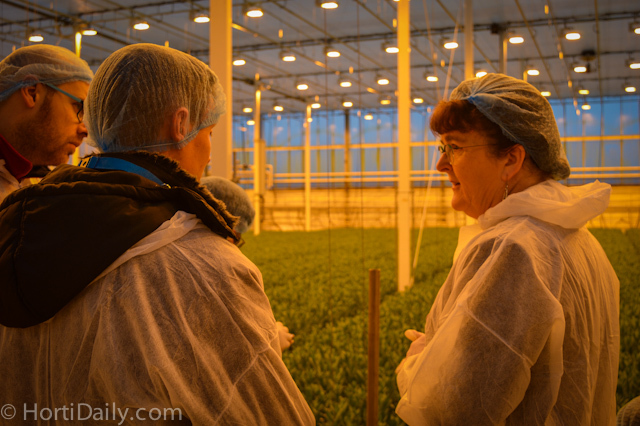 UK grower Addy Breugem of AA Growers and Anke Le Guével of Philips Horti discussing LEDs at the Futagrow trial. 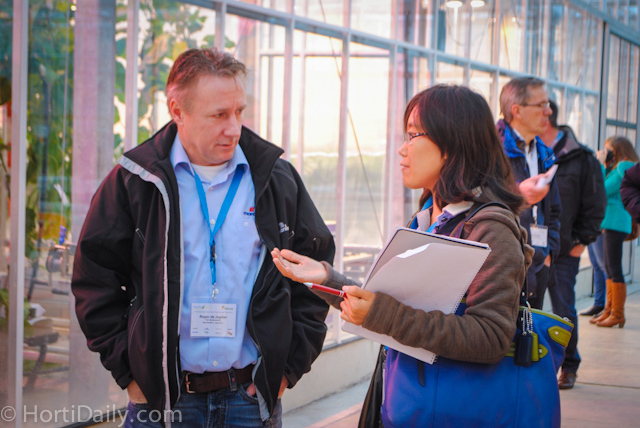 Roger de Jagher from Mardenkro and Li Liu from Costa Farms Australia. 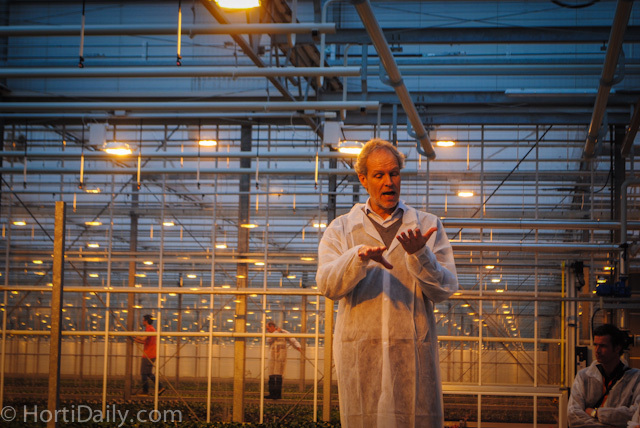 Peet van Adrichem of the Demokwekerij at the FutaGrow greenhouse. 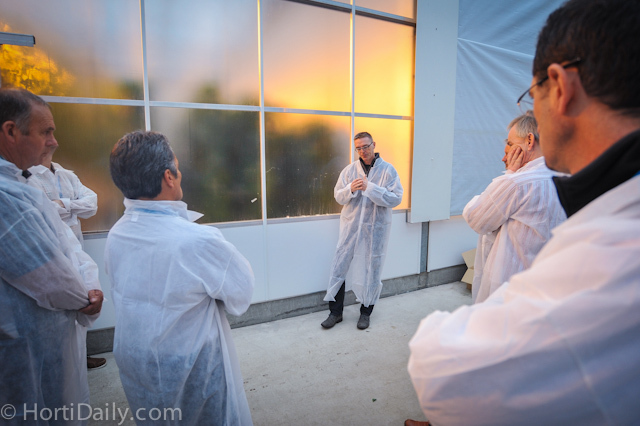 Paul Forgeois of Instut de Genech (on the right) at the Futagrow trial. 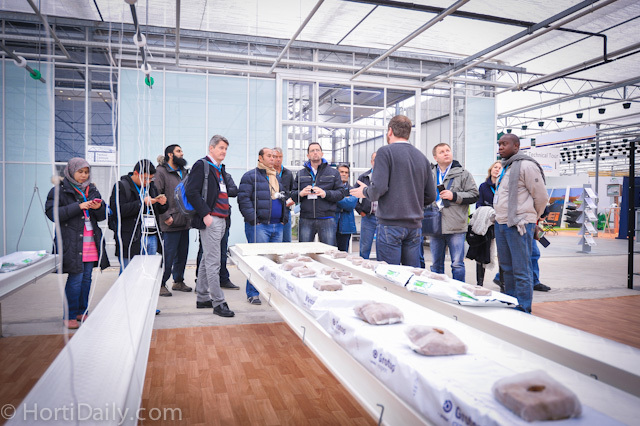 A special gutter system to optimzie in-house propagation of vegetable was presented. 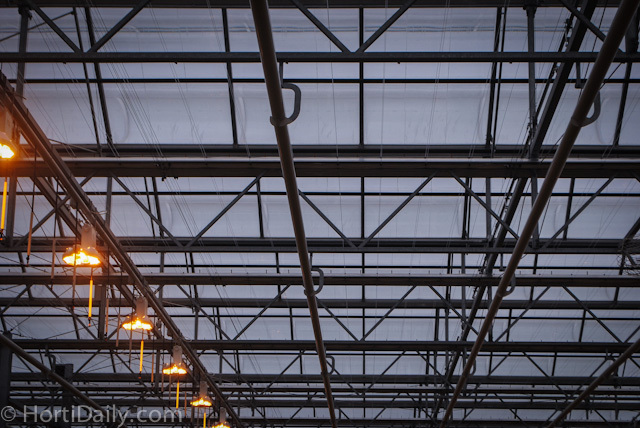 In this order many energy and space can be saved. 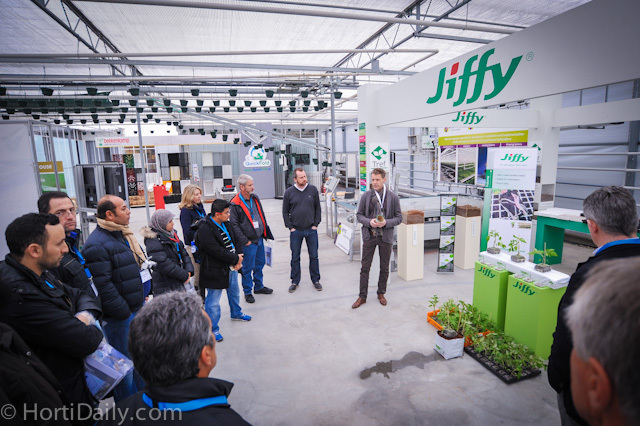 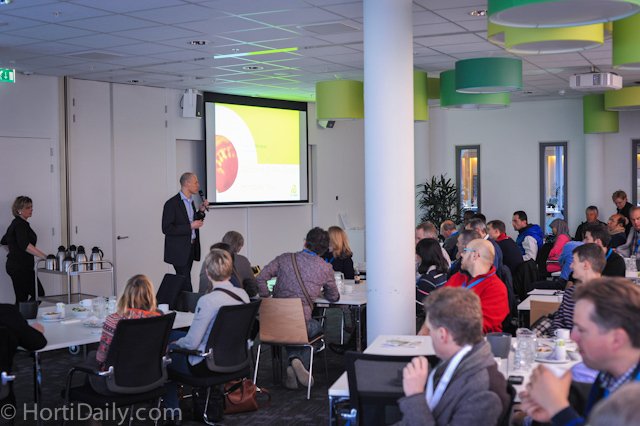 Arjen van Leest of Jiffy explained the use of coir propagation and growing media. 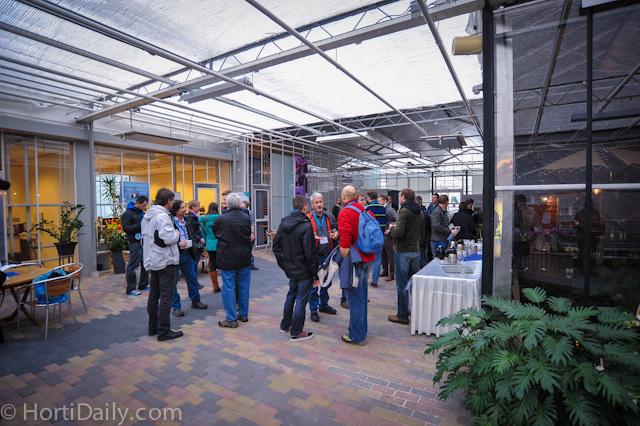 Busy in the Futagrow greenhouse; the large group was split into three. 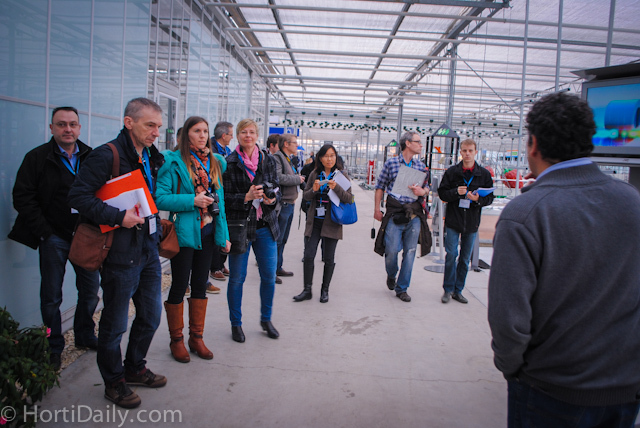 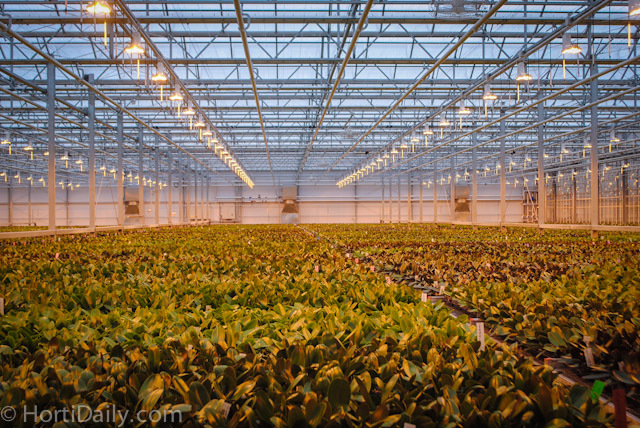 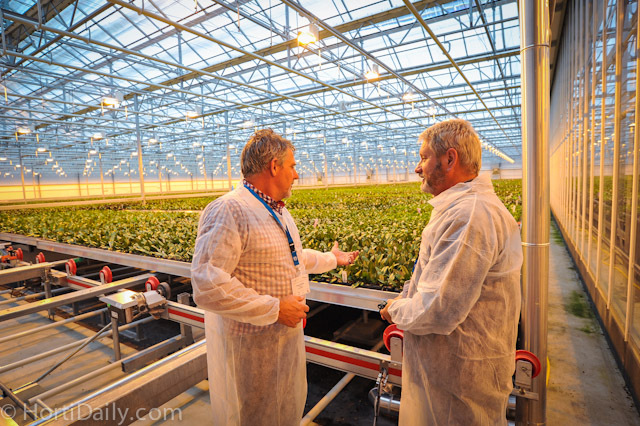 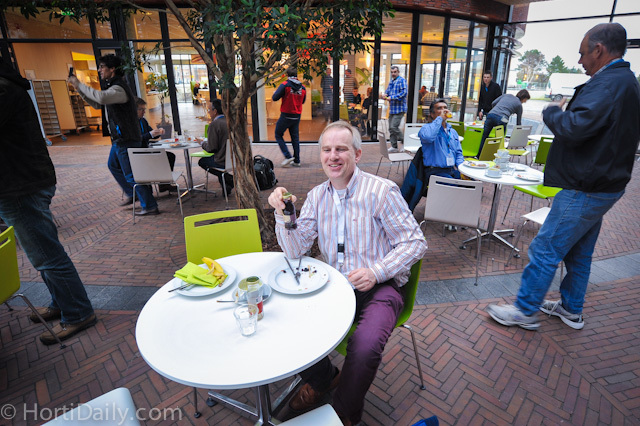 At Ter Laak Orchids we visited the Daylight Greenhouse. 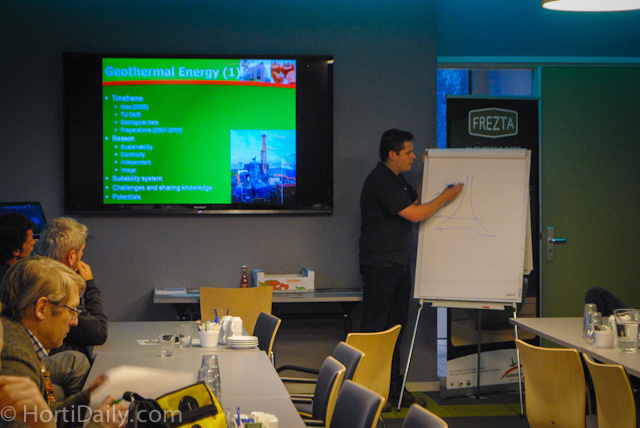 Peter Zwinkels of TechnoKas explained the principles of the energy saving system. 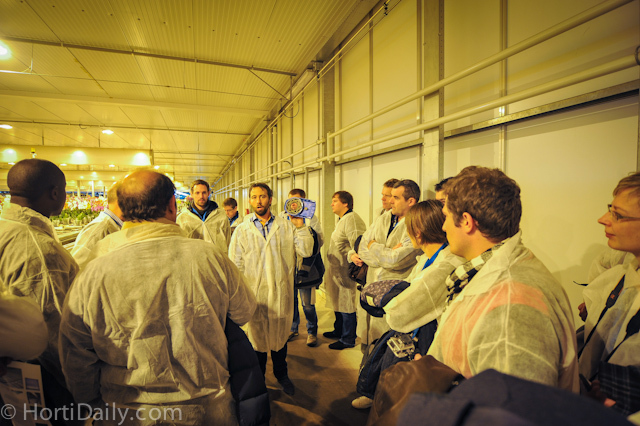 Greg Dutton and Graeme Smith from iFarm. 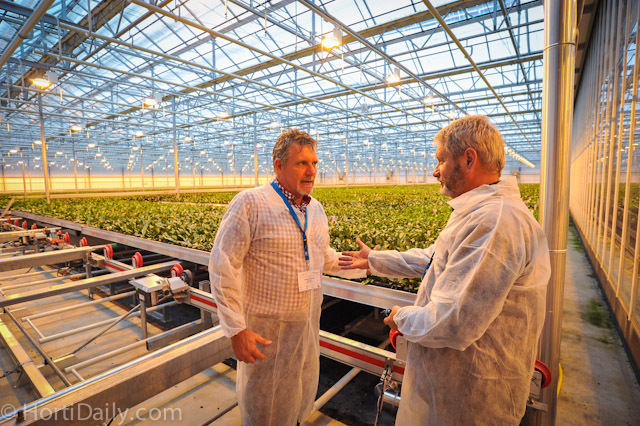 Australians discussing the Daylight greenhouse. 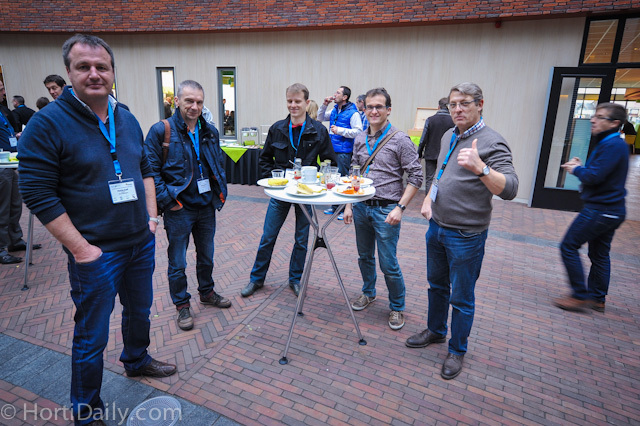 Also at Ter Laak the group was split into two. 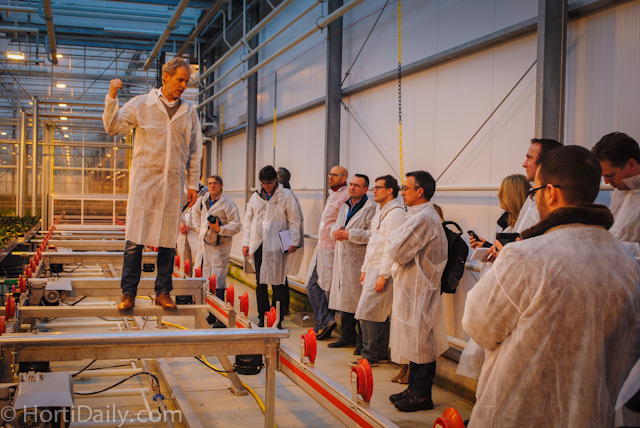 Merijn Kuiper of WPS Horti Systems explained the possibilities of advanced internal logistical systems. 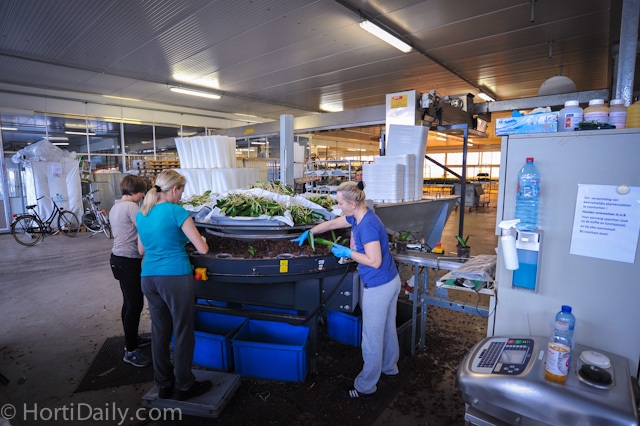 Transplanting and potting of Orchid starting plant at Ter Laak. 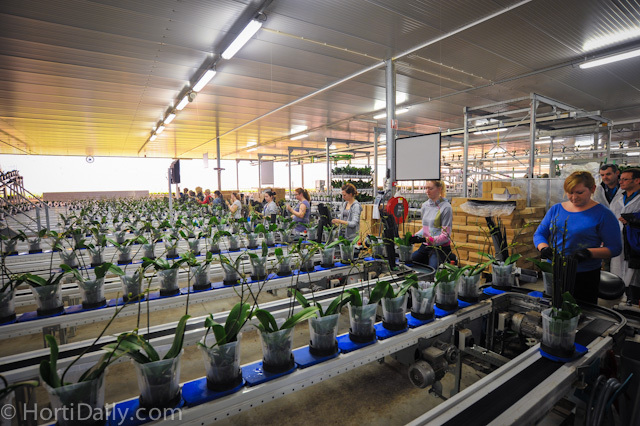 Each orchid is traceable via the RFID tag in Plant Growth Cell. 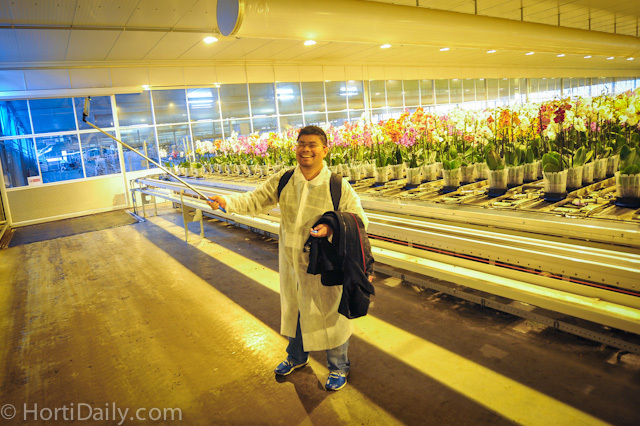 Malaysian grower Muhammad Farooq with his selfie stick. 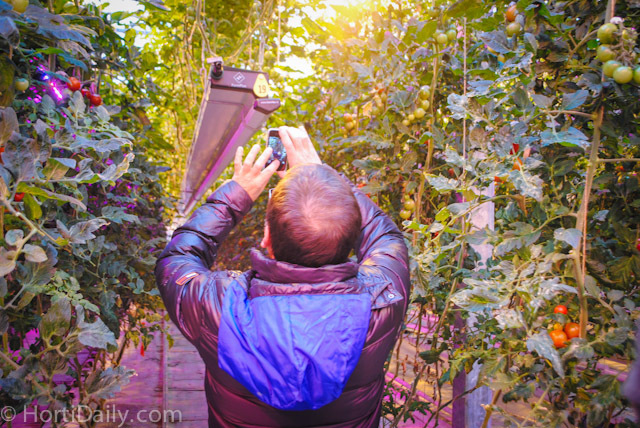 Fresnell lenses and sun collectors in the Daylight Greenhouse at Ter Laak. 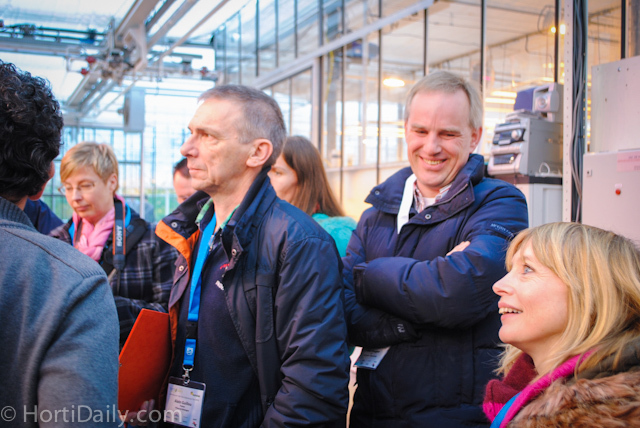 The group was impressed by the internal transport and orchids at Ter Laak. 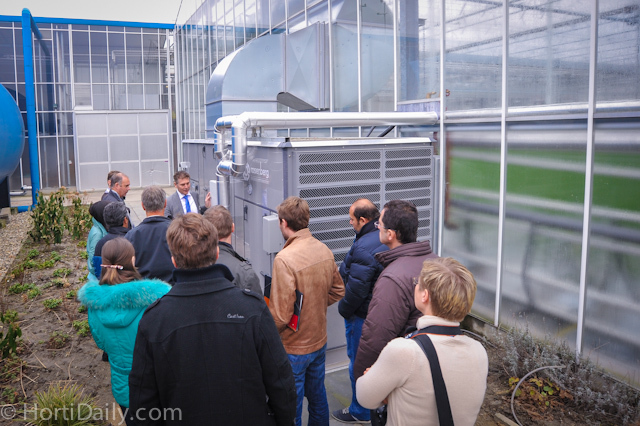 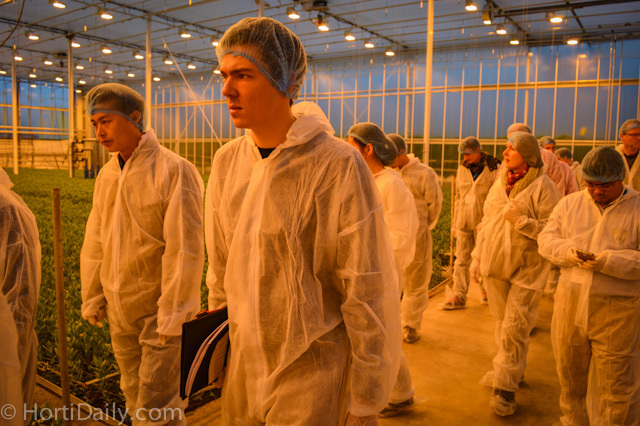 Romanian grower Christian Ghiga of Semtop was impressed by the energy saving capacities of the Daylight Greenhouse. 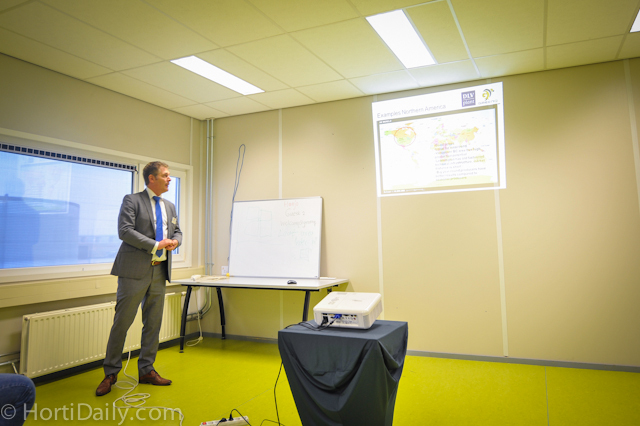 Grower Richard ter Laak gave a presentation on the position of his company in Dutch ornamental horticulture. 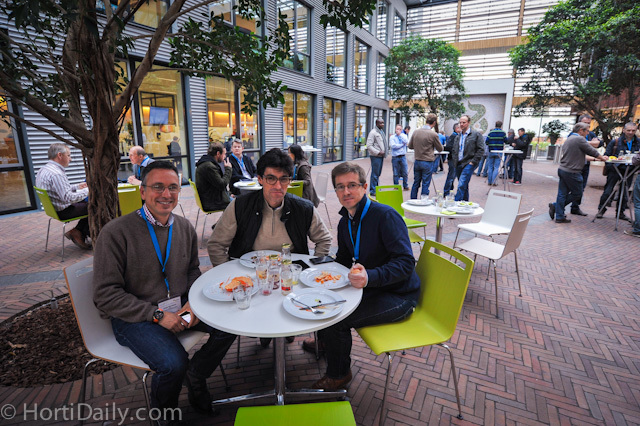 The Spanish growers; tomato grower Angel Baranco of the Spanish National Research Council and José Enrique Colomina Pérez of Bonnysa and Rafael Alberola of Saltadero, the largest tomato growers in Spain. 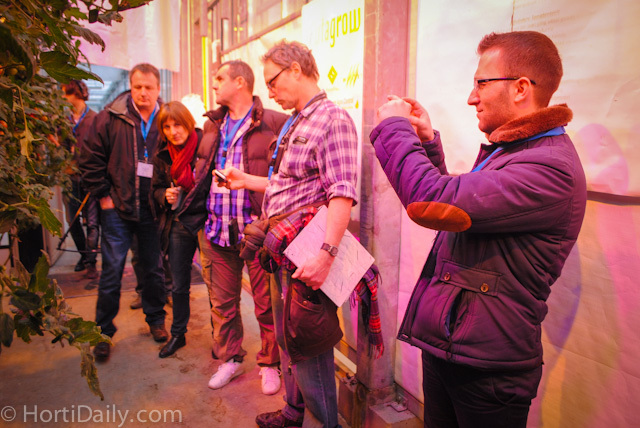 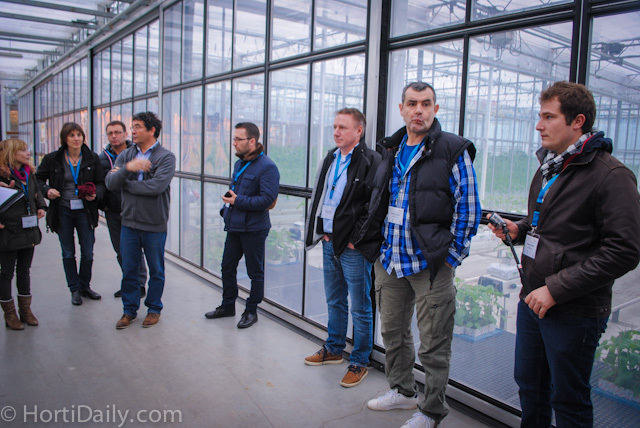 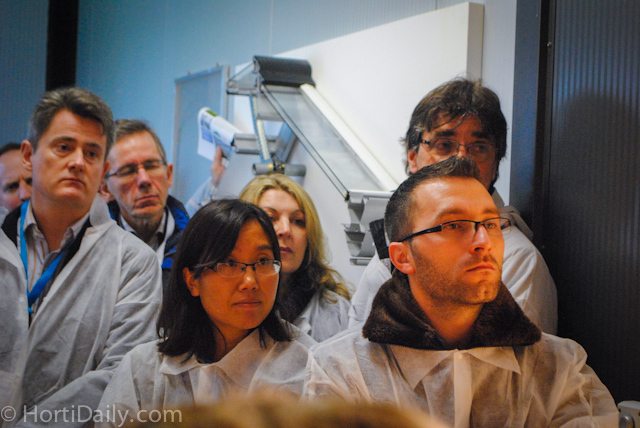 A large group of French greenhouse growers was also present at the tour. 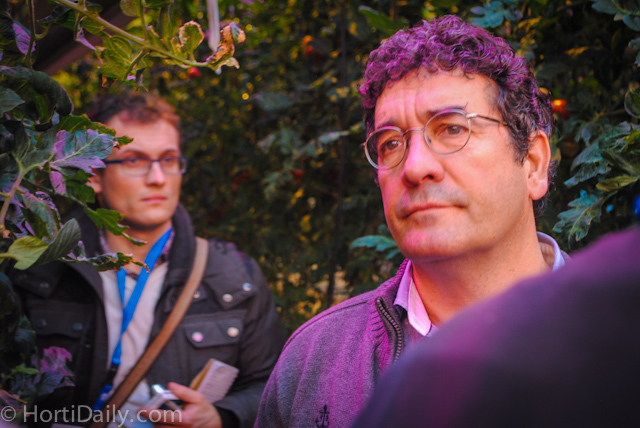 Addy Breugem of AAGrowers on Taneth Earth. 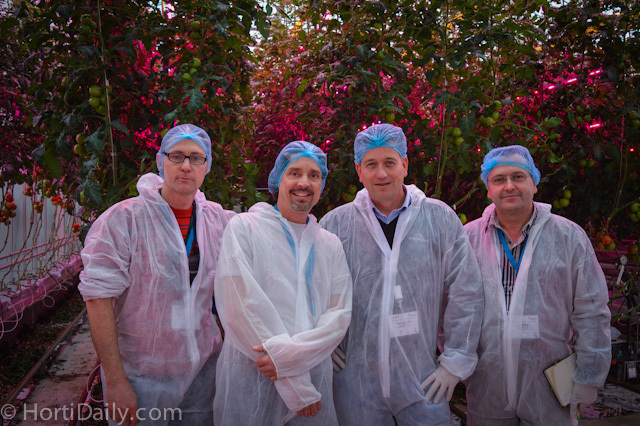 Paul le Duff, Alain Guillou, Baptiste Deconinck, Christophe Brame and Paul Forgeois. 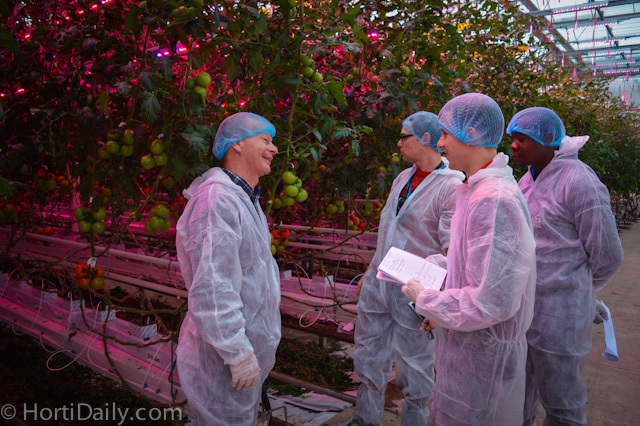 Russian growers Viktor Berko and Oleg Velikorodnyy from Blackeath of Belgorod. 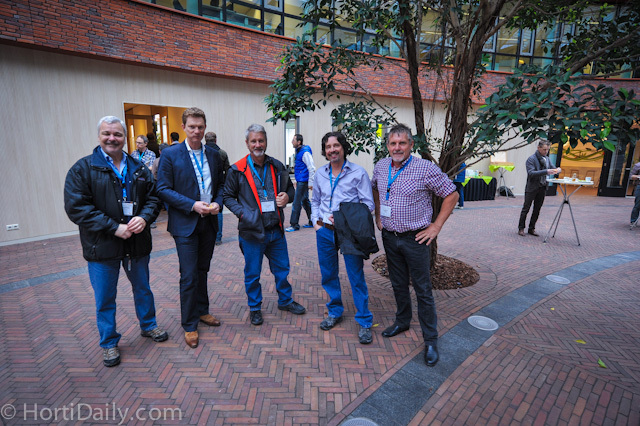 Louis Chapdelaine (ML Aquaponics, Canada)Jan Schutrups (Royal Brinkman), Graeme Smith (iFarm group) Marc Laberge (ML Aquaponics, Canada) and Greg Dutton (iFarm Group Australia). 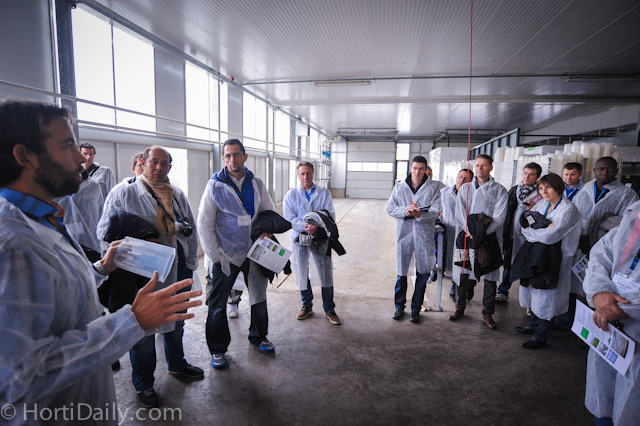 Jan Doldersum of Rijk Zwaan. 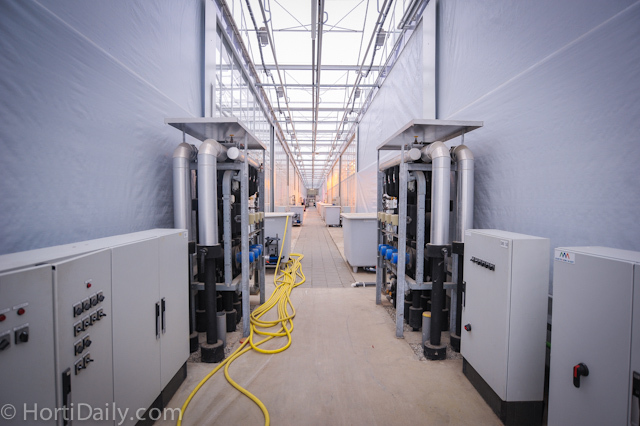 The double glazed ID Greenhouse at Gebroeders Duijvestijn. 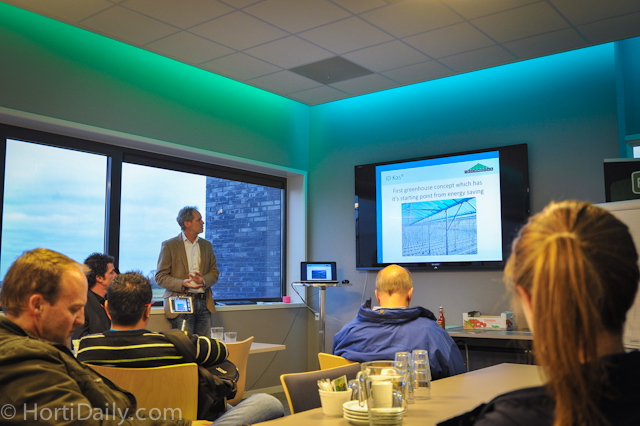 Ad van Adrichem of Duijvestijn tomatoes explained the capital investments and risks of geothermal energy. 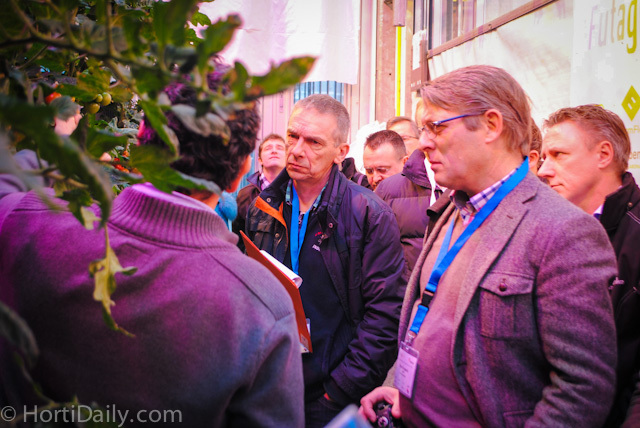 Peter Zwinkels of Technokas on the double glazed ID Greenhouse. 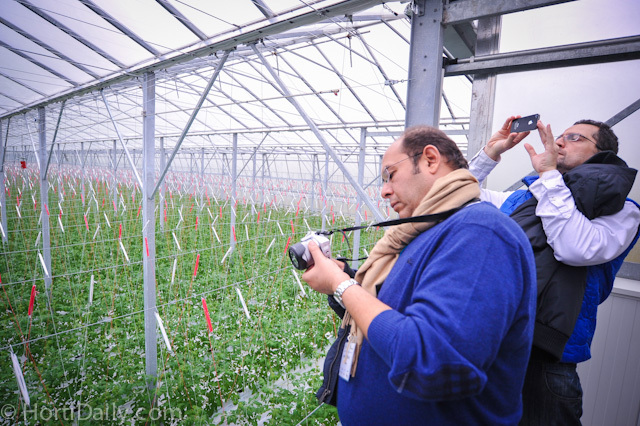 Growers Mahmoud Riad and Said Badr El Kady from Egypt. 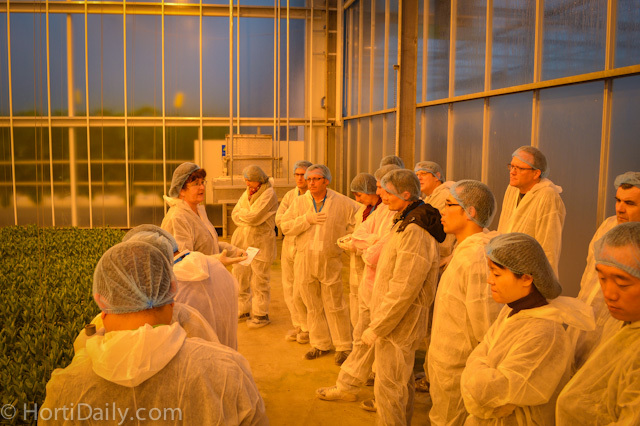 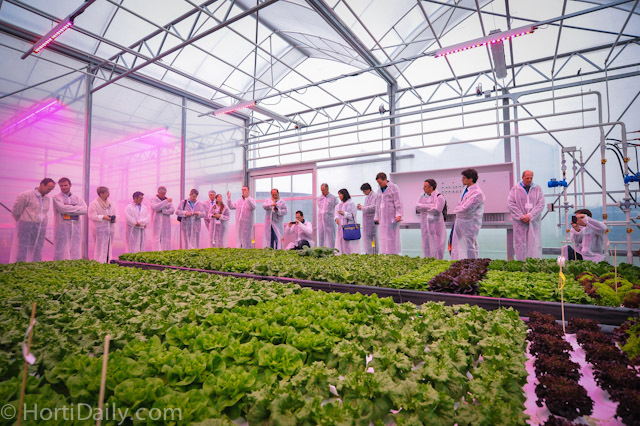 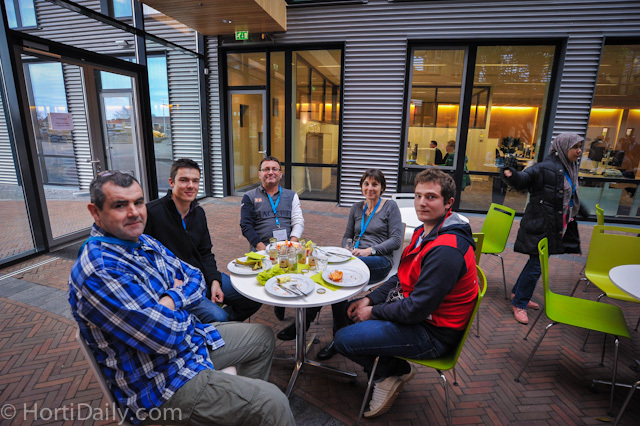 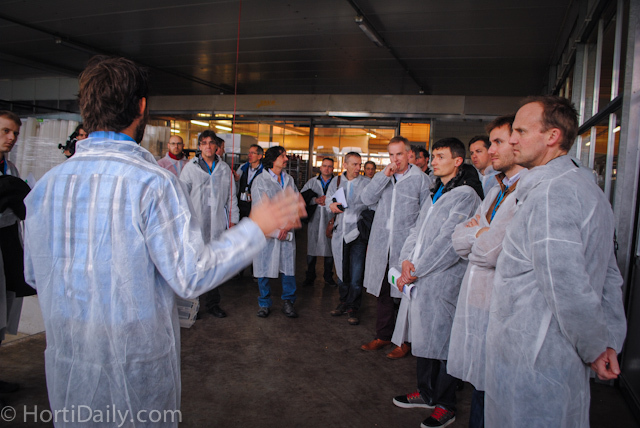 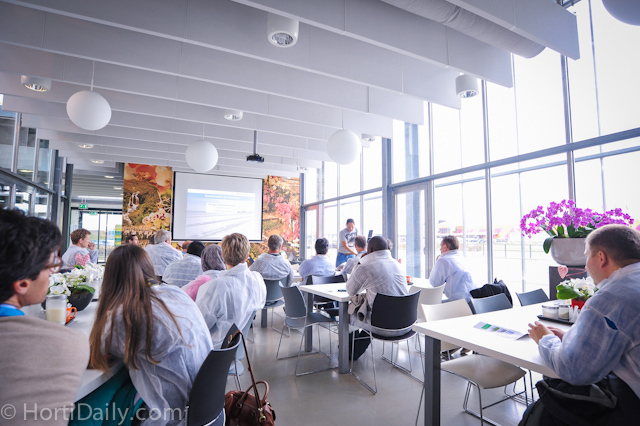 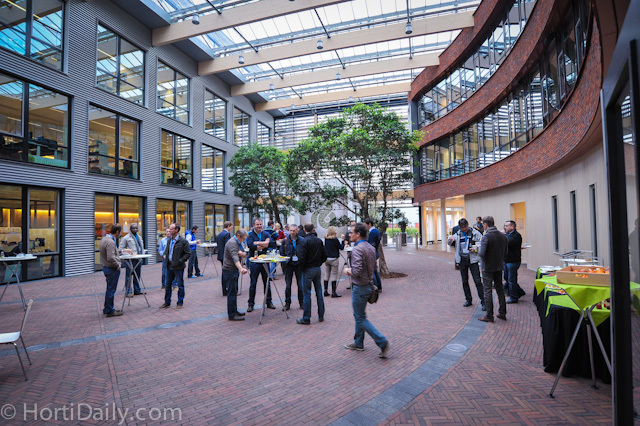 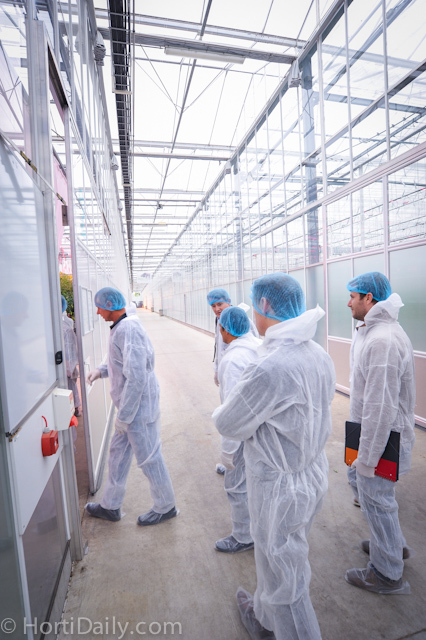 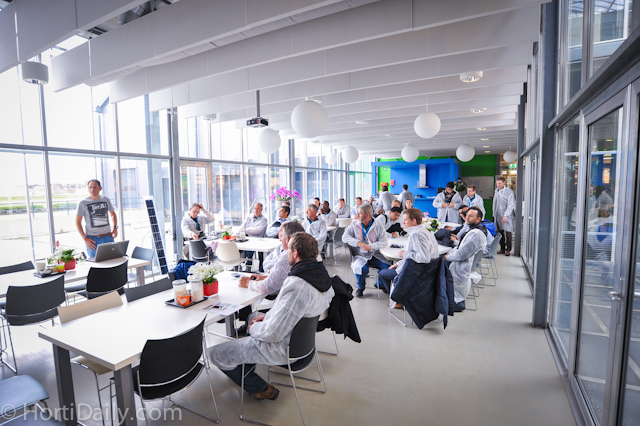 On the second day a training program was organized by GreenQ - DLV Plant on the Horti Science Park in Bleiswijk. 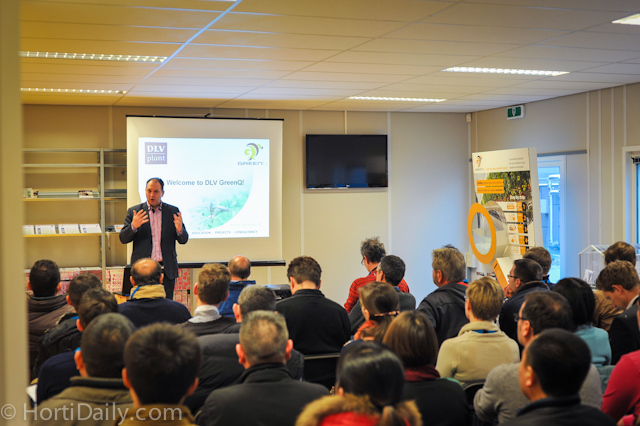 Aad van de Berg of GreenQ welcomed the participants. 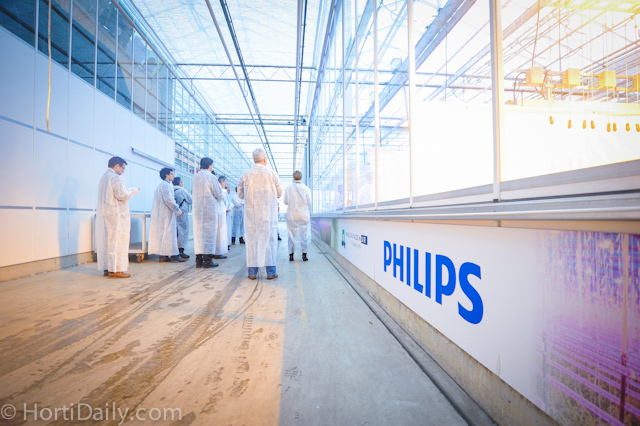 The Philips LED trials gained much attention. 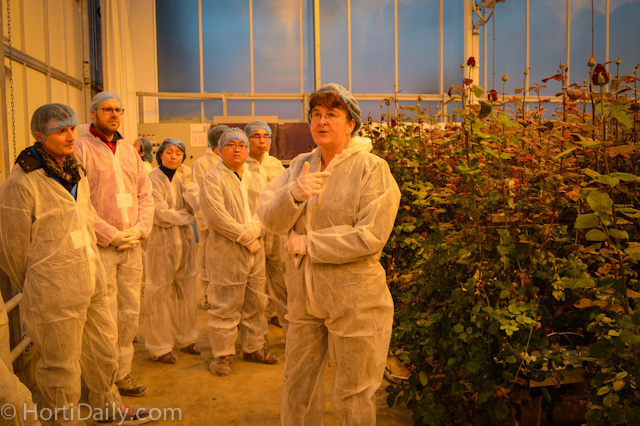 Ineke van Meggelen from GreenQ explained the international growers how Lisianthus are cultivated. 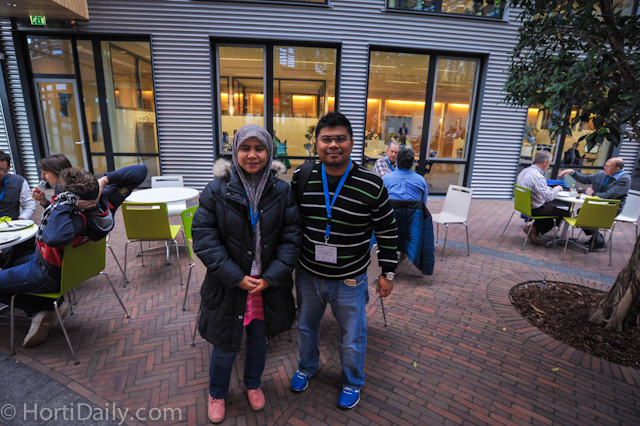 She told about the features and habits of the flower and the techniques that are used to create an optimal environment. 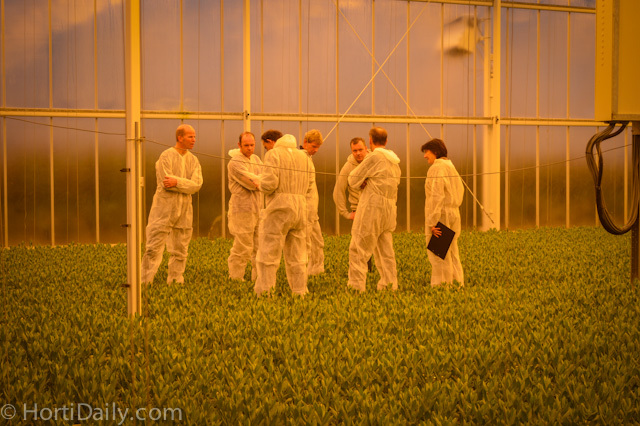 Scientists who are researching and discussing the growth of the Lisianthus. 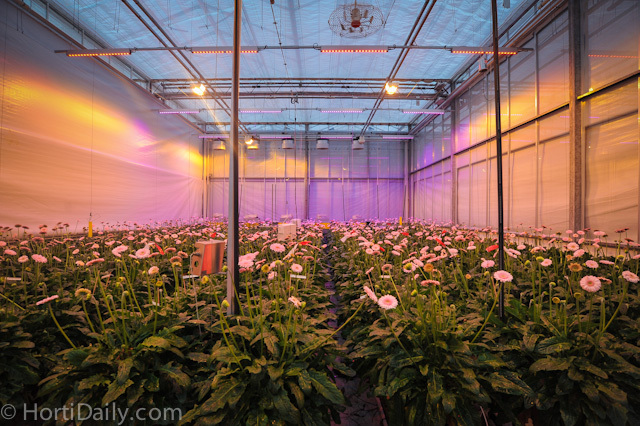 In the Lisianthus greenhouse. 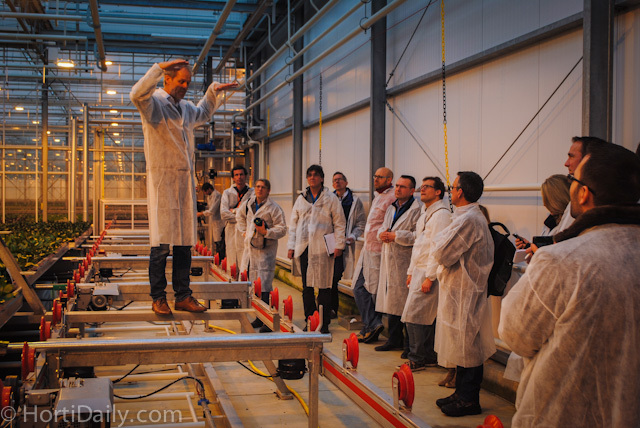 Ineke van Meggelen from GreenQ explained the group how hydroponic Lisiantes are cultivated with an eb and flow system. 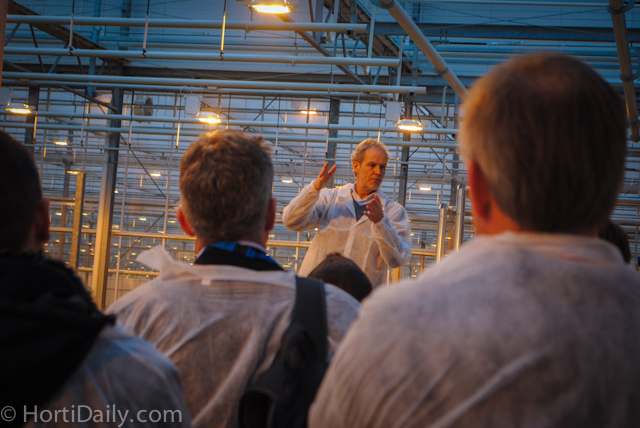 Diffuse glass was a much discussed topic during the tour. 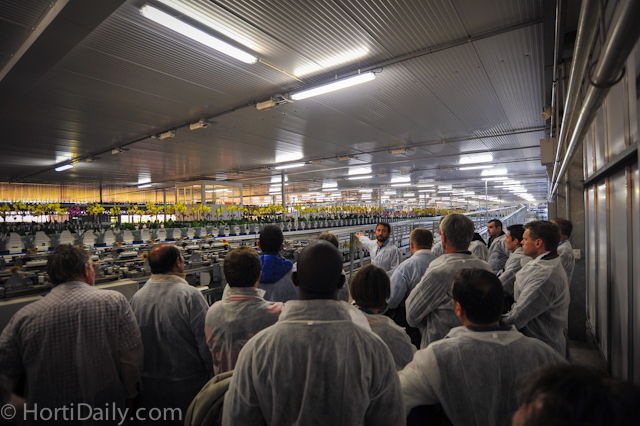 The group was fascinated by the eb and flow system on which the lisianthus are cultivated. 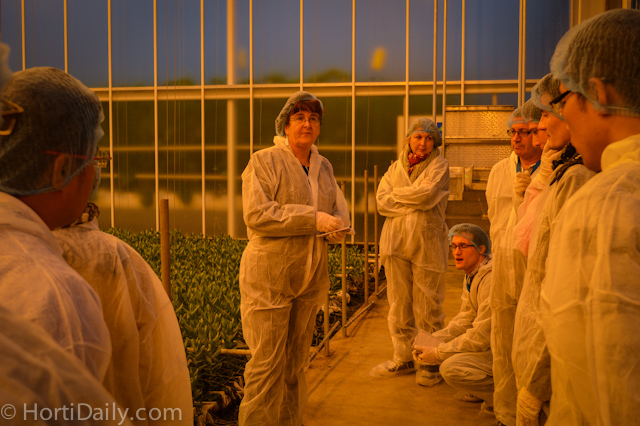 Ineke van Meggelen from GreenQ explaining the habits and features of Lisianthus and what to bear in mind when growing the crop soilless. 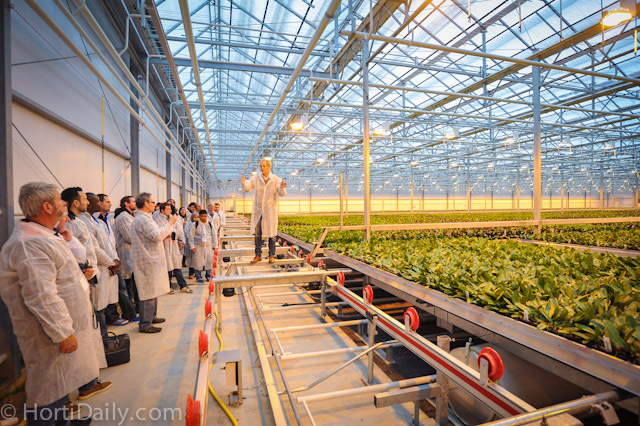 Strawberry LED trials at Wageningen UR. 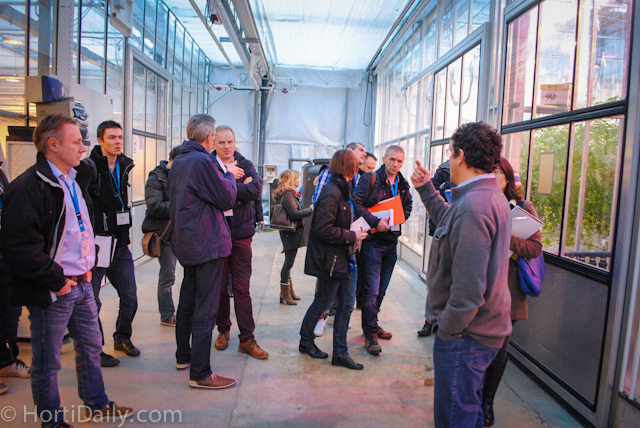 The group is heading to the next department in the Horti Science Parc. 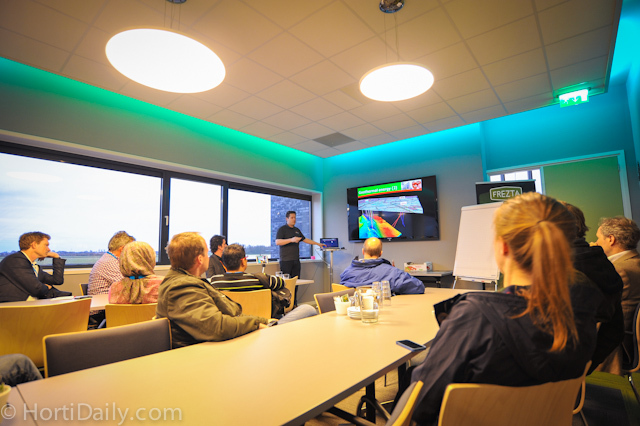 Ineke van Meggelen from GreenQ informs the group about the eb and flood floors of Erfgoed. 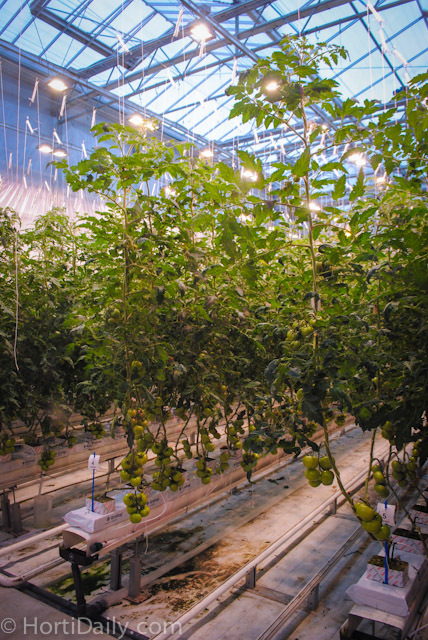 This greenhouse researched the possibilities to grow a high quality crop with smallest amounts of inputs in terms of investment and energy. 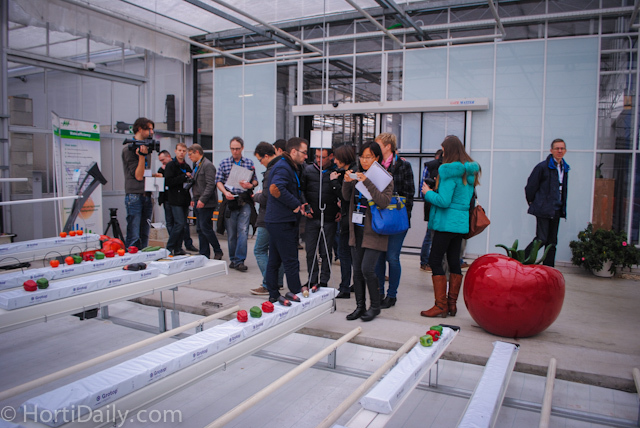 It was the only plastic greenhouse that we visited during the tour, but still very high tech. 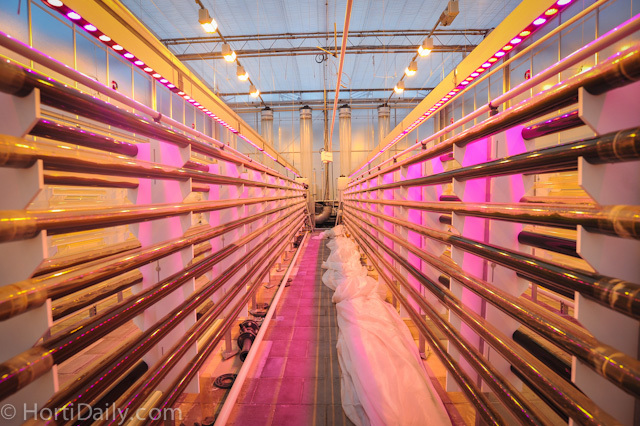 Algea might be the greenhouse crop of the future. 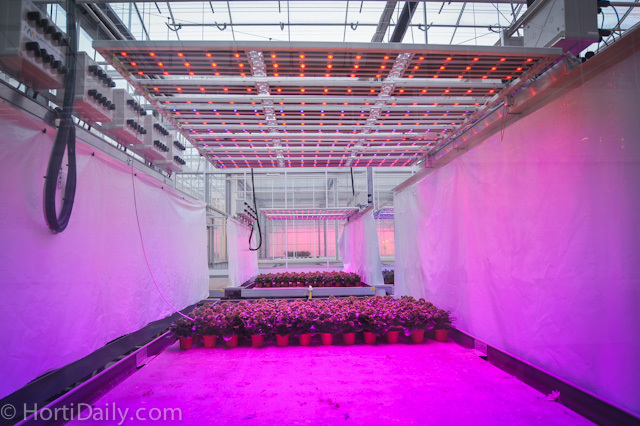 In this trial, the combination of LED top lighting and inter lighting aims art a production of 101 kilo per square meter. 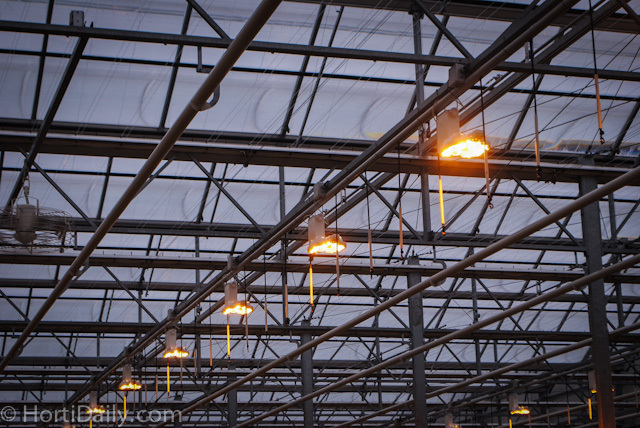 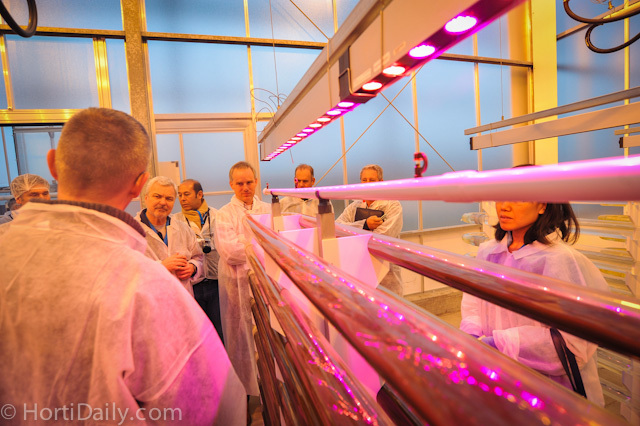 Looking at the LEDs that are placed within the tomato crops. 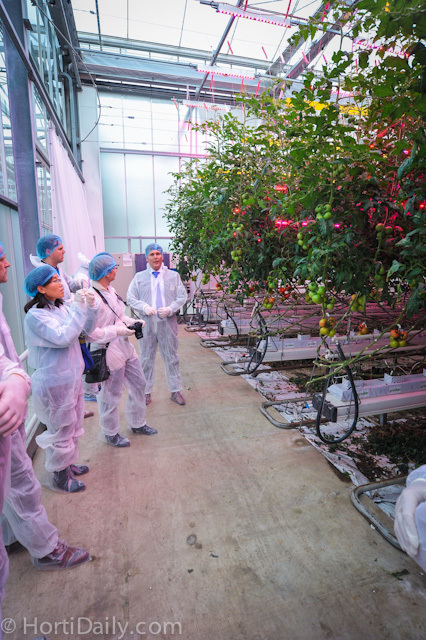 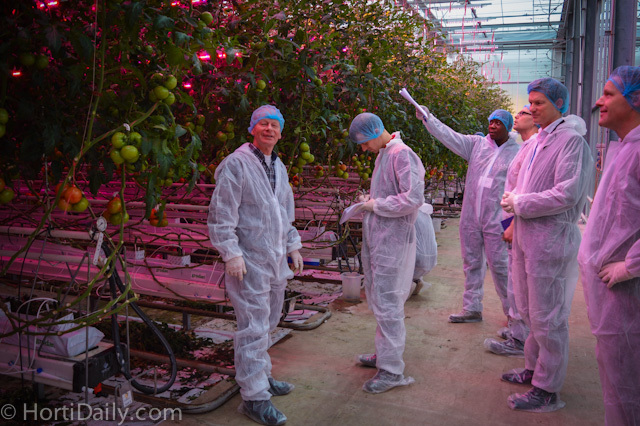 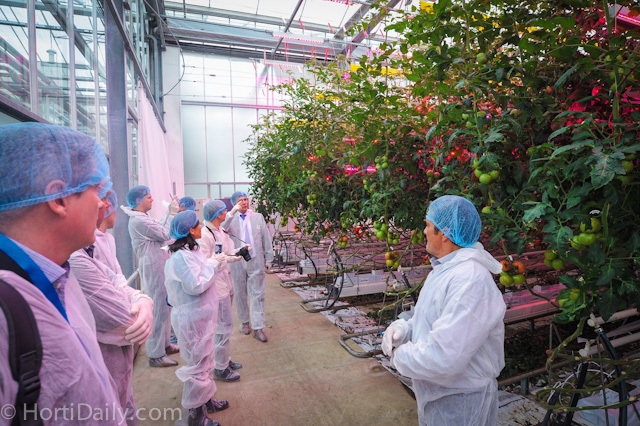 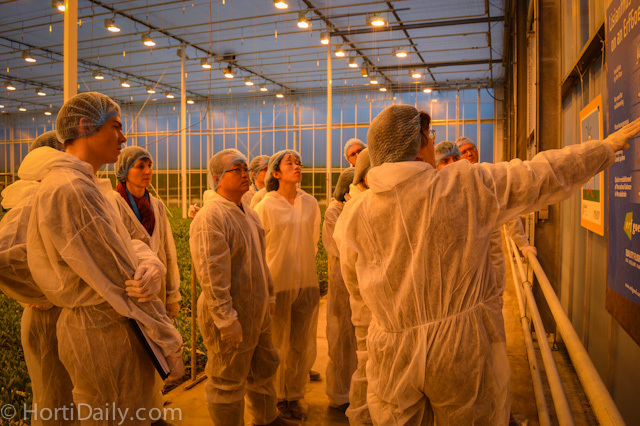 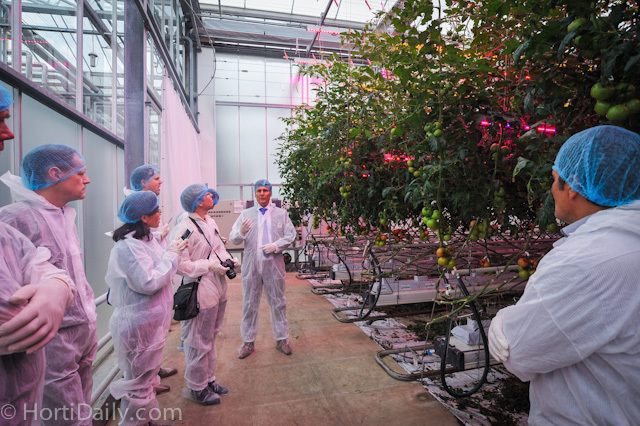 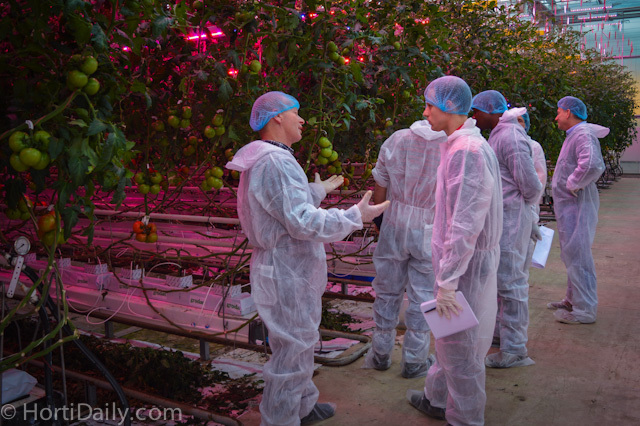 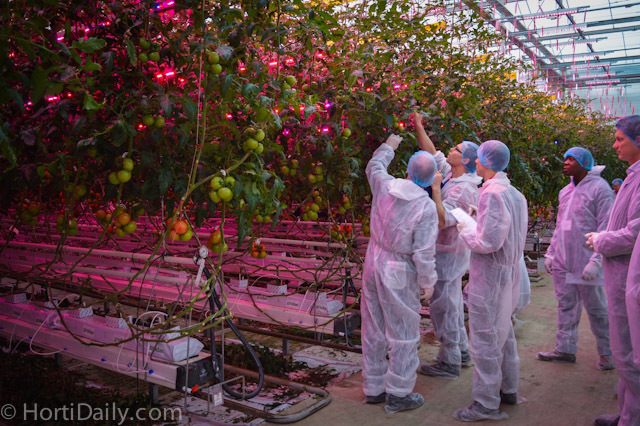 Much discussion was going on about the potential of LEDs in tomato crops. 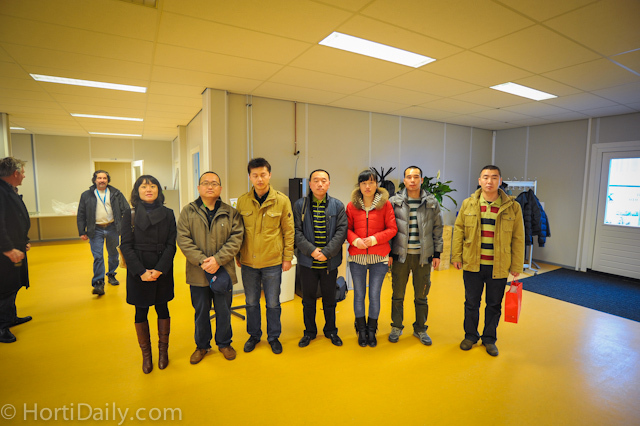 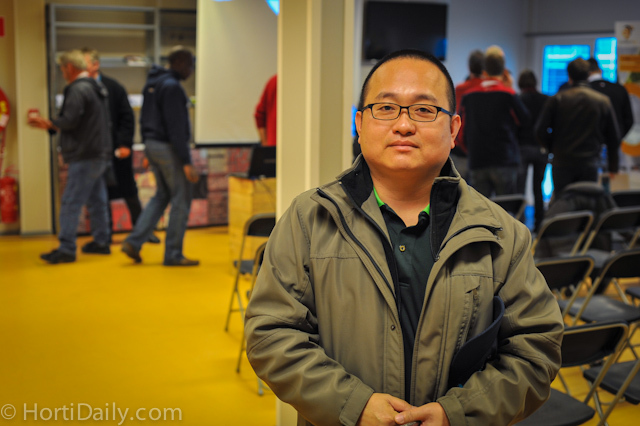 The delegation from China led by Benson Kuo. 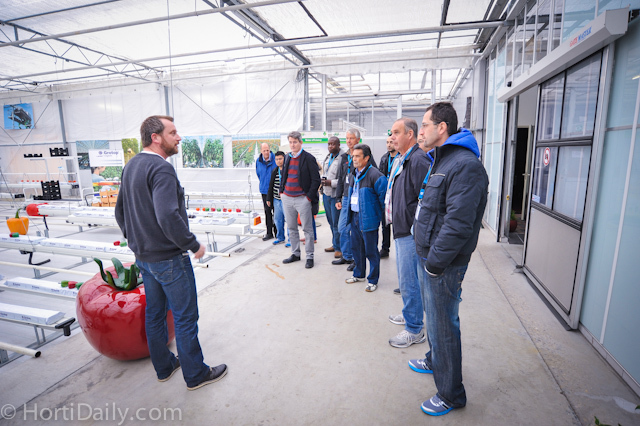 Three international growers together with Paul van Gils from Mardenkro (second right). 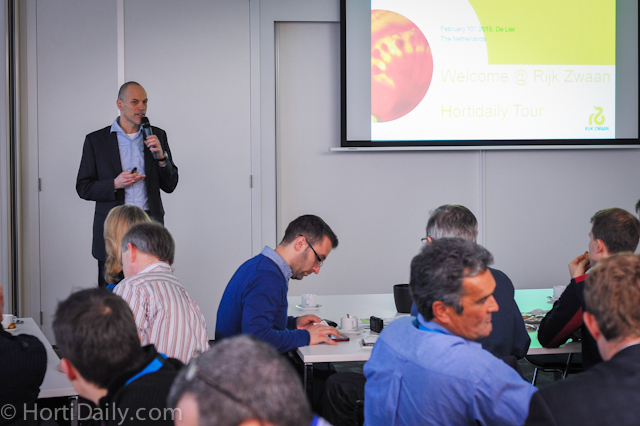 Jilles Goedknecht of GreenQ explained the global trends in horticulture. 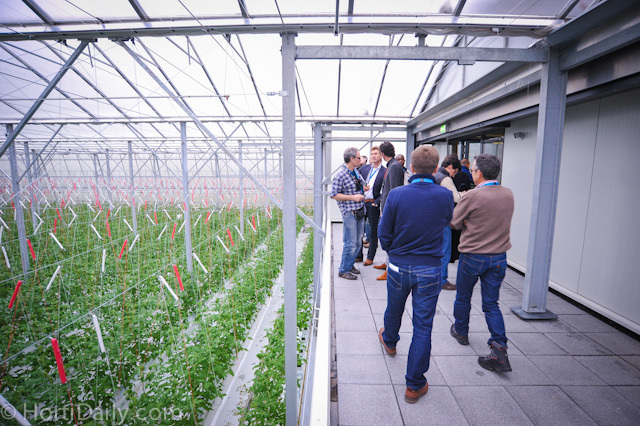 Ineke van Meggelen from GreenQ gave a presentation about the habits of a tomato plant and the ideal circumstances for the plant to grow in. 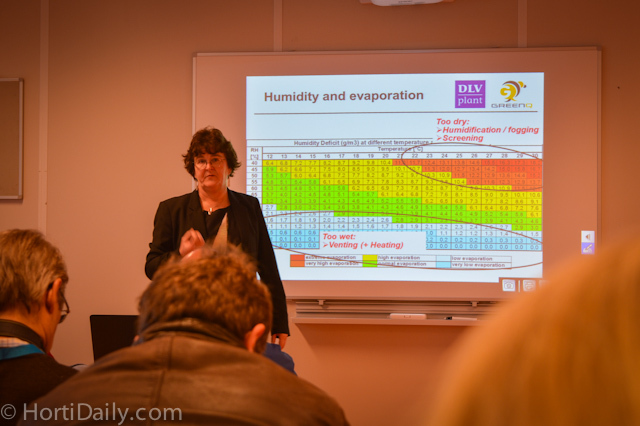 With this slide, she explained the consequences of humidity and temperature on the evaporation of the plant. 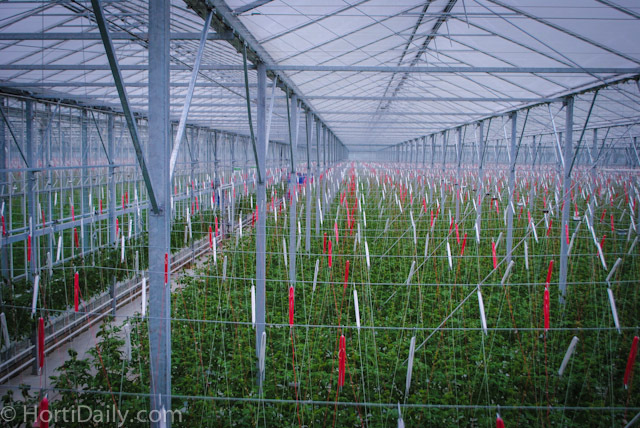 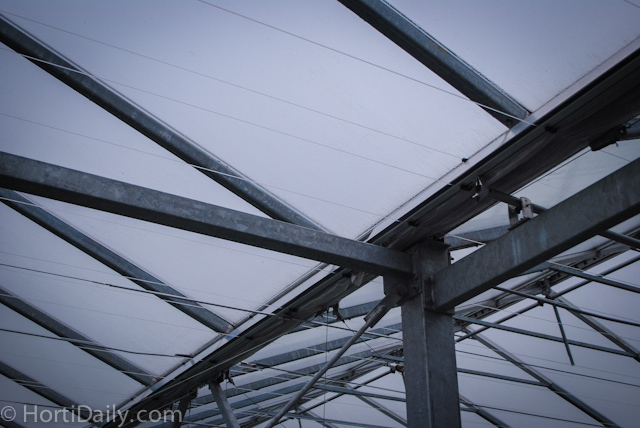 Also the Semi closed greenhouse and the new way of growing (The New Cultivation) was discussed. 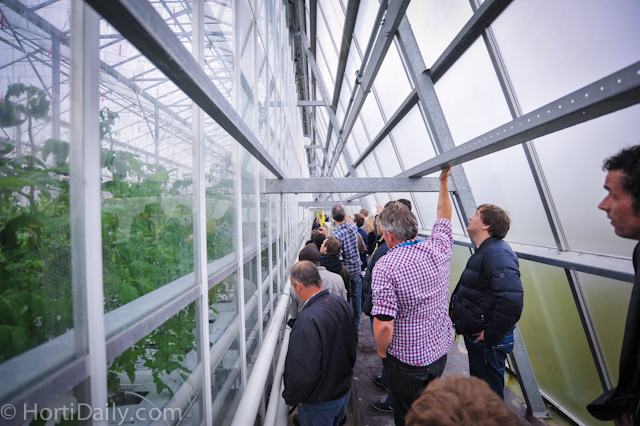 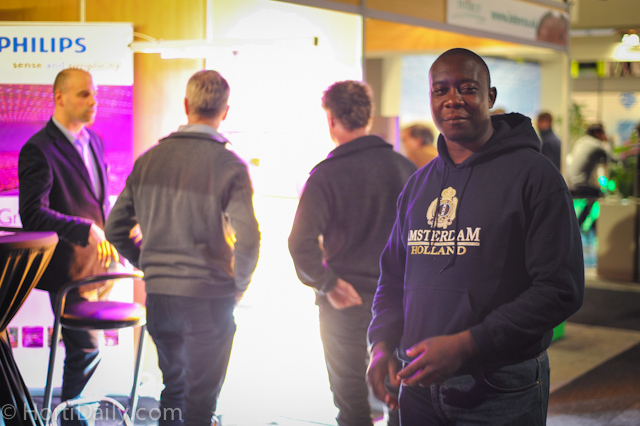 On the last day we also visited the Horticultural Busines Days trade show in Gorinchem. 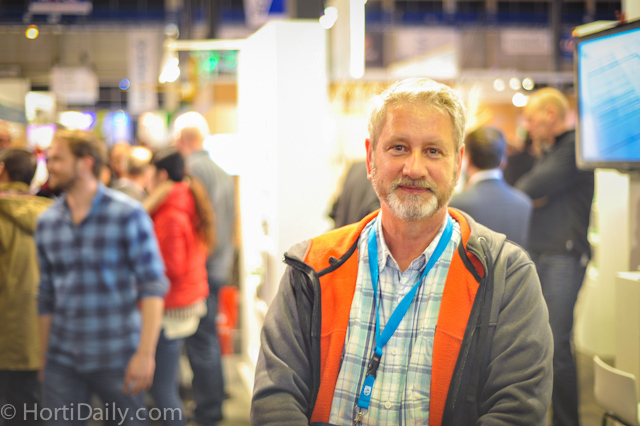 Graeme Smith had several appointments at the trade show. 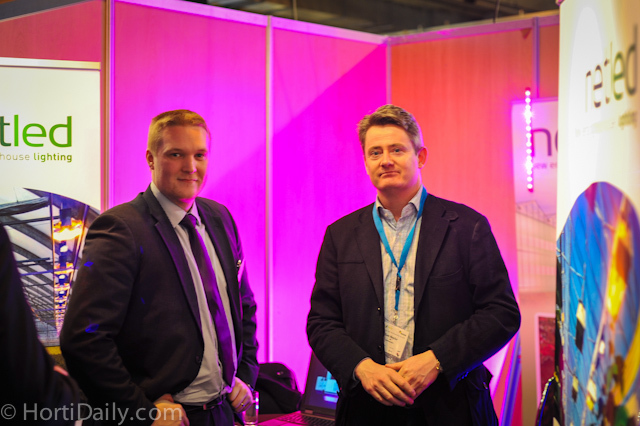 Niko Kivioja of NetLed welcomed tour participant Tom Naylor in his booth. 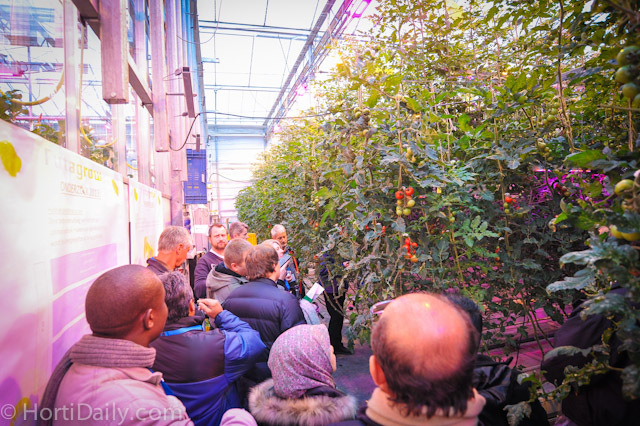 Egyptian growers Said Badr El Kady and Mahmoud Riad got well informed at the show. 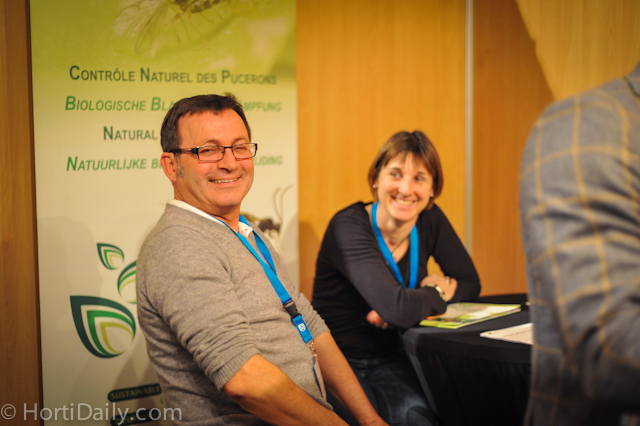 French cucumber growers at the Viridaxis booth. 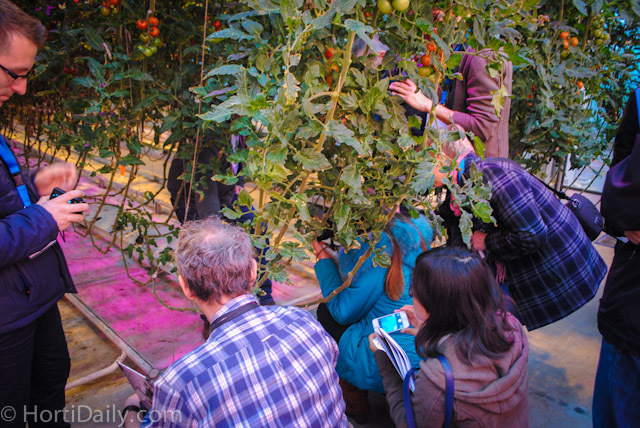 Leslie Tambudze of Netherburn Farms Zwimbabwe enjoyed the tour a lot.